Fancl IS one of my (Cherry’s) favorite skin care brands. Why? At first, generally to say, no stinky perfume, nor stinger on my face. In this time, I am going to share with you my personal review of Fancl BC Lotion, formula of 2017. They changed the formula of BC line in AW2016 to SS2017. I got a sample of new one, and I liked it. I bought small bottles when they sold. It is the difference between Moisturizing line that is this sticky. It might be the reason why Fancl is using pump for this lotion. I felt there are not so much big difference between the previous formula, and this formula of 2017. I will be glad to buy this new formula, as my rescue lotion. I am so happy. Below is the review for the previous formula, written in 2015. I used this when my skin condition was pretty bad. I will keep this review in this formula too. This BC Lotion is sticky, but this lotion is also smooth on my skin. You can use as you want, but you may find you do not need to use pretty much quantity. I am happy with this no perfume lotion. Frankly to say I reminded Guerlain’s Lotion, I forgot the name, anyway, I used over 5 years ago. As I remember Guerlain’s lotion was ” no need to use emulsion” system, and for my skin those days, I liked excluding its perfume. I can also image someone will use this BC lotion as “no emulsion” , as long as you have not pretty much dry and enough oil on your skin. For my dry skin, it is good. Sticky lotions are often keep in the surface of my skin and I dislike them, but as this sticky, I can bear. No, this was the very what looking for. With Fancl BC Emulsion & BC Concentrate, my skin is getting better and better. Finally I found there is an acne on my cheek today :), it means it is too much for my current skin. It is the time to back to Fancl’s Moisturizing line for me. 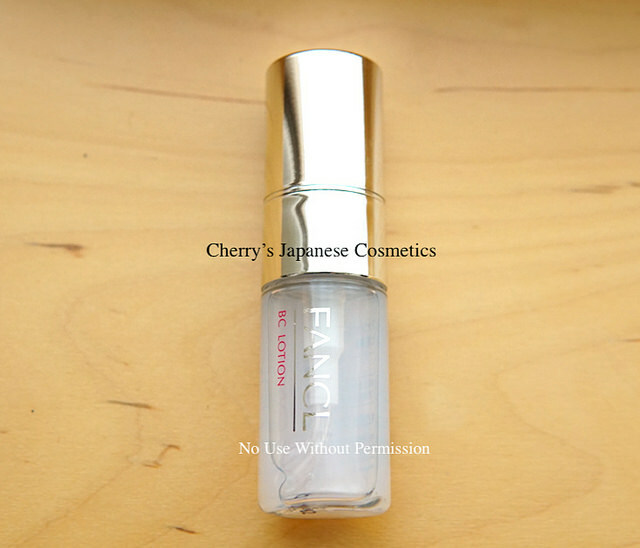 Please check the latest price, and order from here: Fancl BC Lotion.